Passages, many of them about the nature of translation, rise into and out of three languages in Translation. The piece can play without intervention, but it can also be operated, which makes its workings, its ways of changing, more evident. As a piece that may be easier to watch or look at than to read, Translation plays with the boundary between visual art and literature as much as it does the boundaries between English, French, and German. Author description: Translation (version 5) investigates iterative procedural "movement" from one language to another. Translation developed from an earlier work, Overboard. Both pieces are examples of literal art in digital media that demonstrate an "ambient" time-based poetics. As it runs the same algorithms as Overboard, passages within translation may be in one of three states — surfacing, floating, or sinking. But they may also be in one of three language states, German, French, or English. If a passage drowns in one language it may surface in another. The main source text for translation is extracted from Walter Benjamin's early essay, "On Language as Such and on the Language of Man." (Trans. Edmund Jephcott and Kingsley Shorter. One-Way Street and Other Writings. 1979. London: Verso, 1997. 107-23.) Other texts from Proust may also, less frequently, surface in the original French, and one or other of the standard German and English translations of In Search of Lost Time. The generative music for translation was developed in collaboration with Giles Perring who did the composition, sound design, performance, and recording of the sung alphabets. Instructions: To hear the sound, turn on the computer's speakers or plug in headphones. 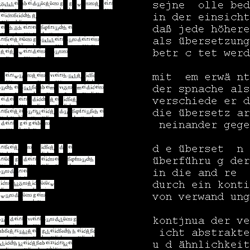 Translation is intended, primarily, simply to run in ever-shifting patterns of language, though you can hold down key combinations to produce a limited range of effects, as follows (you will need to hold the keys down for 3-5 seconds before the effect begins) — Shift-S: restart the quasi-randomization of verse states (resume normal ambience of the piece). Shift-D: Surface in German. Shift-F: Surface in French. Shift-E: Surface in English. Shift-Q: Fade to black. Previous publication: Translation was published by Cayley on his site, http://www.shadoof.net/in, in 2004.